Many women are looking for ways to get rid of varicose veins. Experience varicose veins disease, it is very embarrassing and make less confident. Varicose veins are not just a matter of aesthetics, but also can lead to other serious problems such as leg swelling, skin color changes, bleeding, blood clots, and pus. Varicose veins occur in the veins which carry blood metabolic waste of all body tissues and back to the heart. 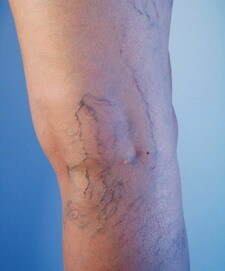 Varicose veins are caused by reduced elasticity of vein walls. Cause the veins weakened and unable to drain blood to the heart. Varicose veins cause blood circulation is not smooth, due to obstructed around the calves and legs while holding your body weight. In addition to the legs, later known that varicose veins can occur in the arms. Varicose itself appears caused by several things ranging from genetics or heredity, even it can arise because of your daily habits that are unhealthy such as having excess weight, standing too long, rarely exercise and smoking, suffer from high cholesterol, diabetes, and often wear high heels. Besides that, also most pregnant women have varicose veins. At first the feet and legs feel heavy, followed by muscle easy to soreness, stiffness, heat and pain around the feet and legs. Usually pain is felt in the evening, due to the interrupted blood flow. Easy cramps, although the foot in a relaxed condition. Popped blood vessel dilation hair that like cobwebs (spider navy). Changes in skin color (pigmentation) around the ankles, due to the interrupted blood flow. Sometimes followed by wound around the ankle are difficult to heal. Leg swelling (edema) due to the damming of blood. Changes in the external veins, such as in the back of the calf veins appear bluish and winding. This situation is a symptom of chronic varicose veins. For those of you who are overweight. Should reduce weight. It is not without reason, many studies say varicose veins often easier to attack someone who is overweight. This is because the foot in patients with obesity will sustain heavy loads, resulting in a time can lead to varicose veins. Standing too long to be one of the causes of varicose veins. Therefore, avoid standing for too long. But if you have to force your work stand for a long time, make sure that you do not stand up to the same state for a long time. Move slightly to the blood vessels are not rigid. After the move every day, lie down with your feet and legs higher than the heart for 20 minutes. For those who are suffering from varicose veins, try sleeping with a position like this all night. for blood circulation to the heart. To avoid or eliminate varicose veins in the lower legs you can use elastic socks, elastic socks usage is expected to suppress the section that has slowly and prevent varicose veins veins protruding. To get rid of varicose veins, or prevent varicose veins you should avoid tight clothes, tight clothes can cause blood flow to be blocked so it becomes less smooth flow of blood to be pumped to the heart. For you lovers of high heels, you should start reducing the habit of wearing high heels. Avoid eating too much sugar, salt and fried foods. This is what makes people with high cholesterol and diabetes risk have varicose veins. Healthy foods can prevent varicose veins. Vegetables and fruits that contain lots of fiber and foods that can stimulate blood circulation such as onions and garlic-ginger. Do not forget to take vitamin B complex, C, E, B6, folic acid, magnesium, calcium and zinc. Avoid spicy foods such as black pepper, especially when your veins to swell. Maybe the doctor will perform sclerotherapi, a popular treatment in treating varicose veins. Or by using a laser. A procedure without injections or surgery. The blood vessels may require four to six laser therapy, and it takes about 15 to 20 minutes for each laser therapy. Dietary fiber foods can lower blood pressure in arteries in the legs, promote regular bowel movements and prevent constipation which is a factor causing varicose veins. Fiber-containing foods include green vegetables, asparagus, beans, and pomegranates. Research shows that flavonoids work with vitamin C to strengthen the membranes of blood vessels and reduce vein damage caused by free radicals. Flavonoid-containing foods such as apples, oranges, grapes, and berries. Tannins are antioxidant compounds that can help reduce blood vessel leakage and protect the vein from damage. Tannin contained in all kinds of berries.